The format you take depends on your test center location. Every year, thousands of students just like you are preparing to take the TOEFL test and study abroad. Sharing this common goal means there's plenty of help out there, but it could take months to locate and bookmark what you need here we are trying to provide all the required information on TOEFL. How Test Questions Are Created? Language specialists prepare TOEFL test questions and follow rigorous, standardized procedures to ensure that test material is of consistent high quality. Each question is reviewed by several ETS staff members. The TOEFL Committee of Examiners - an independent group of professionals in the fields of linguistics, language testing and language teaching that reports to the TOEFL Board - establishes guidelines for test content. 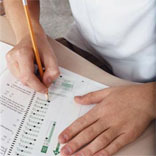 After test questions have been reviewed and revised, they are administered in trial situations and assembled into tests. Tests are reviewed according to ETS and TOEFL program procedures to ensure that all tests are free of cultural bias. Statistical analyses of individual questions ensure that all items provide appropriate measurement information. If you are planning to study abroad, the TOEFL test is the one test that can take you anywhere. In fact, more institutions accept TOEFL test scores than any other test scores in the world - more than 6,000 colleges, universities and licensing agencies in 136 countries, to be exact. And, with more than 4,300 test centers worldwide, taking the test is convenient and easy. The TOEFL iBT measures how well you read, listen, speak and write in English and use these skills together in the university classroom. For example, you might read a passage or listen to a lecture, and then write or speak about what you learned. To become more familiar with how the TOEFL iBT is structured and what types of questions are on the test, solve TOEFL iBT sample questions. ETS offers a variety of TOEFL preparation and practice materials to help you do well on the TOEFL iBT. These include free TOEFL sample questions, practice tests, a CD with listening passages and spoken answers, a multimedia program to help with pronunciation, and detailed TOEFL tips and information for understanding more about the TOEFL iBT. TOEFL Practice Online is the only official practice test that gives you the experience of taking the real TOEFL Internet-based Test (iBT). You will be able to review and answer authentic test questions and get instant scores and feedback on all 4 skills measured on the test - Reading, Listening, Speaking and Writing. You can take the practice test at home, at school or wherever there is an Internet connection - 24 hours a day, 7 days a week. Each volume has a different set of questions, so you can practice a few times to prepare for success on the TOEFL iBT.